After 10 years as a successful practicing chiropractor, Dr. Brad Lustick was severely injured in an automobile accident. His injuries resulted in an inability to continue active practice - but strengthened his commitment to help others deal with and overcome chronic neck and back pain. So, in 1994, Brad, in partnership with his wife, Rose, opened Back Be Nimble to share knowledge of the back and body with the public by selling products for self-care, relief and prevention of pain and suffering. Back Be Nimble endeavors to provide customized solutions and specific items needed to improve comfort and relieve pain. We believe in offering real, doctor-tested, solutions for back pain; and that life can be virtually pain-free at any age. We believe your participation in the quest for relief is vital to long term results. It is our contention that, other than the obvious acute phase of an injury, most of us suffer painful conditions due to persistent stress or improper practice of our daily routines. With 24 hours in each day, we must consider and perhaps modify the way we sleep, sit, work and play. Our goal is to increase awareness of proper lifestyle execution and to review, select, test and provide products that play an important role in the modification of lifestyle and resolution of painful conditions. Giving back: as you place confidence in us to provide you with products that heal injuries and support the back, we are honored and proud to support our veterans and wounded warriors through the Wounded Warrior Project (www.woundedwarriorproject.org). Back Be Nimble has served and cherished over 500,000 customers, including high-profile organizations as Intel, HP, IBM, Charles Draper Labs, N.A.S.A., Computer City, University of California, University of Washington, Hollywood Celebrities, and all of you guys. As the pioneer of e-commerce for products of this sort, it is our intention to continue to be your most vital link, having offered over 1000 doctor-tested products for shipment to your doorstep. Back Be Nimble offers the most comprehensive online catalog of ergonomic and therapeutic products available. In many cases we offer more information, personal and professional testimonials and product use guides than the manufacturers themselves. While our goal is to help others, it's always nice to know that our hard work is appreciated - so, here are just a few awards, recognitions and kudos of which we are most proud. Back Be Nimble was honored in 1999 as a Blue Chip Enterprise Award Winner - #1 in Texas, actually! 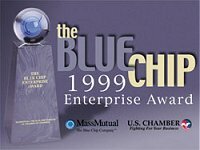 The Blue Chip Enterprise Initiative was established in 1990 and is an annual event sponsored by Mass Mutual The Blue Chip Company, the U.S. Chamber of Commerce, and Nation's Business. "What stands out [about] the Blue Chip companies is not just their fortitude in the face of adversity but also their attention to business fundamentals. In many cases, it is clear that the reason Blue Chip designees survived and prospered when other companies would not have is that they adopted sound business practices." Yahoo Internet Life honored Back Be Nimble with a coveted 4-Star Best In Class Rating. "... BACK BE NIMBLE offers an exceptionally well-organized and accessible online catalog of ergonomically correct products for home, sleep, office, and travel. ... With extensively thorough product descriptions and quick-loading illustrations, it doesn't have to be a pain in the neck to relieve your lower back pain." Britannica.com's editors reviewed and selected Back Be Nimble as one of the best on the Internet for quality, accuracy of content, presentation and usability. We have endeavored to comply with the HONcode standard for trustworthy health information. Houston dba Magazine: first Houston Retail business to be successful on the internet. EzSpree Partner: asked us to be an American Express partner for their online Sweepstakes. Gift Certificates - redeemable online. Back Be Nimble is a BBB (Better Business Bureau) Certified Safe Shopping Site.